A Greek Revival Colonial built in 1905, Edgewood Manor boasts of five ornate fireplaces, incredible woodwork, "rare Grueby Tile", and wonderful antiques all decorating this stunning house. We have eight guest rooms and all have private baths,some with jacuzzi whirpool tubsand some with fireplaces. 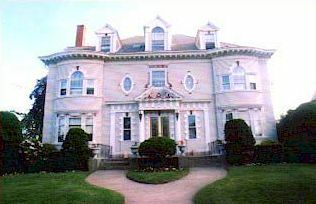 The Newhall House built in 1892, located next door, has 6 guest bedrooms and is a massive Queen Anne Shingled Style Victorian. Both properties are on the National Historic Register as well as all the houses on the street.